EUR 1.335,64 Buy It Now 10d 2h, EUR 154,47 Shipping Estimate, Click to see shipping cost, 30-Day Returns, Pay with PayPal and you're fully protected. 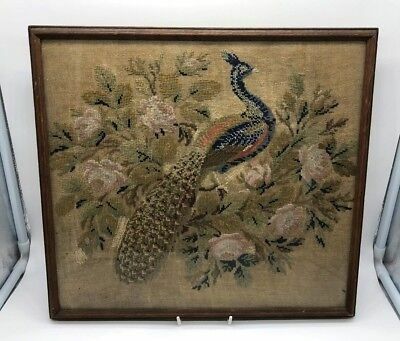 Seller: antiquesuncommontreasure (7.397) 100%, Location: San Marcos, California, Ships to: Worldwide, Item: 302734606928 RARE Antique c.1816 French Silk Embroidery Needlework Sampler, Chenille, Empire All items and photos are the express property of Antiques & Uncommon Treasure. No reproduction without prior written consent. If you like what you see, be sure to click here to add us to your Favorite Ebay Seller's List. We'll be sending out sale notices and special deals to our 'Favorites' customers. One of the finest old silk embroidery samplers we've had in ages, I bought this and another (listed separately as #1) last month in Paris. Hand painted faces and arms, the rest is all silk embroidery, including lots of chenille work. 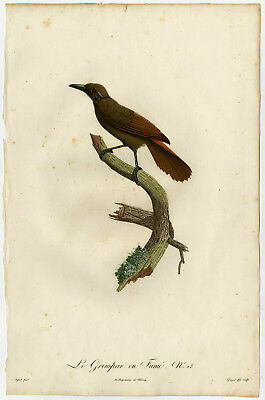 This one dated August, 1816, evidenced by notes on back, and perhaps the note also named the embroiderer and her age. I can't make that out. Subject a playful pastoral with children and dog. 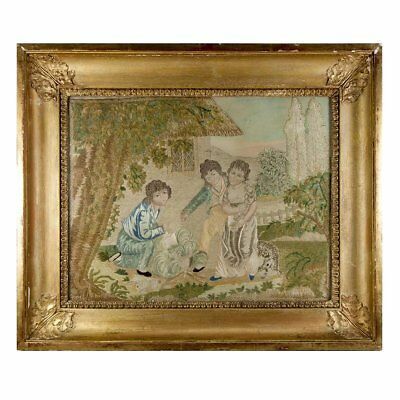 We know these finely crafted old silk embroidery tapestries are often the work of quite young girls, some signed in silk and giving the age. 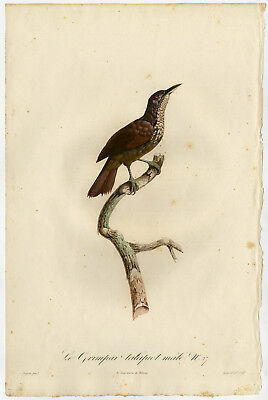 This one is truly exceptional and is one of a matching pair, the other offered separately - look for it, too. Very good to excellent condition for age and type. So fine in execution and remarkably fine in condition, the panel of silk is still in the original Empire frame, all original. 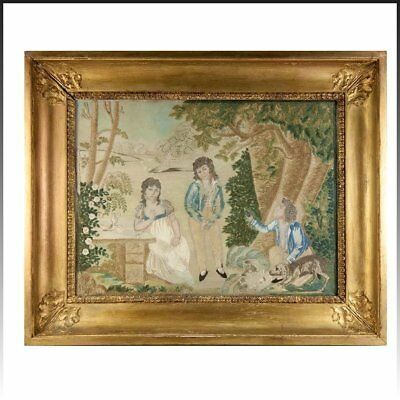 The frame is also a valuable antique and is in very good condition, as well. Protected under the original poured/laid antique glass, you'll see a tiny bubble or line in the glass. There is a slight moisture mark across the face of the one child. There are no tears or deterioration visible to the silk, either painted or sewn. Frame is approximately 17" x 13.5" but accurate measurements noted on the photos. Please look. Image Hosting by Ruby Lane ***BE SURE to also click our our "" icon here or above to see more of our inventory, offerings and venues. We have a HUGE assortment of the finest antiques to be found online, all at your fingertips with Antiques & Uncommon Treasure. Thanks! *** Return Policy: We always honor a 3-day return on our items, and guarantee them to be as described. Money back, less shipping costs, which are not refundable, so ask questions if necessary. We're easy to deal with. Shipping and Handling Policy: You are very important! Our fine inventory is very important. And your ranking of our performance is also very important! We wish to keep our 4.9 - 5 star ratings in all categories. Customer satisfaction is paramount with us, so if you're thinking we have not deserved your highest marks, please contact us and allow us to be sure your concerns are completely satisfied before you rank us. We aim for 5-star transactions every day, and depend upon you to tell us directly if we have not yet met that standard for your transaction. Thank you! We most often use USPS for our shipping needs but will be happy to ship by another carrier if you prefer. We charge only actual postage & insurance, never a handling fee and never for packaging materials. Ebay is now requiring that our clients rank us on "shipping". The shipping price, speed and handling are actually under the sole control of the delivering postal agency, not Antiques & Uncommon Treasure so please remember that and leave us high DSR rankings. As always, please also feel free to contact us if you have any problems or concerns, we'll do what we can to ensure a happy and mutually enjoyable transaction. Insurance has been eliminated as an option by ebay, forcing us sellers to either ship your items without insurance or assume that expense also. We always insure our items BUT, more importantly, pack them extremely well knowing that most are not replacable. Again, damage in transit, while rare in our experience, is due to the postal agency handling and not caused by Antiques & Uncommon Treasure. Please remember that when leaving DSR ratings. Thanks! Our shipping days are Tuesday and Friday, paid items will be shipped on the first shipping day after payment is recieved (except when special circumstances exist). We prefer to use USPS whenever possible, and require all packages to be insured. If you prefer another method of shipment, please mention it. We charge only actual expense of shipment/insurance, except in the case of larger items which must have special wood crates built. Wood crate charge, when applicable, is a flat $35.00 in addition to actual postage & insurance charges. Other Information: 8.75% sales tax applicable as of April 1st, 2009 for shipments & sales within the state of California, no exceptions. If you are within CA and are a dealer buying for resale, you must provide us your active resale certificate # and acknowledgment of intent to resell or we will have to collect sales tax. No exceptions. Auction Payment Methods: Paypal: E-Check, Visa, Mastercard, etc.. Credit card payment by online service only, no direct processing. Listing created with eLister 3.1.2 for Macintosh from Black Magik Software. Popularity - 525 views, 1.5 views per day, 350 days on eBay. Super high amount of views. 0 sold, 1 available. 525 views, 1.5 views per day, 350 days on eBay. Super high amount of views. 0 sold, 1 available. Seller - 7.397+ items sold. 0% negative feedback. Great seller with very good positive feedback and over 50 ratings. 7.397+ items sold. 0% negative feedback. Great seller with very good positive feedback and over 50 ratings.